Detroit is in the middle of a renaissance, once again becoming a thriving example of an economically thriving metropolis. All of this is being spurred on by a project dreamed up by Illitch Holdings, a project called The District Detroit. NECA member Motor City Electric Co. and IBEW Local 58 – Detroit are revitalizing The District Detroit in the latest episode of Electric TV. 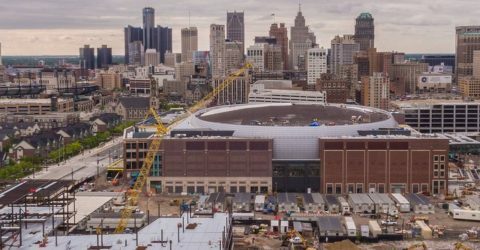 The District Detroit will be home to residential space, office buildings, and retail centers and will be one of the largest sports and entertainment centers in the country. This 50-block footprint will connect downtown to midtown, and the new Little Caesars Arena will be right at the center. The District Detroit is expected to generate $1.8 billion in economic impact, so the team behind this project knew that it had to be perfect. Motor City Electric Co., IBEW Local 58, and Southeastern NECA took on the project, implementing the Code of Excellence from day one. This commitment to excellence taken on by the Powering America Team caused a ripple effect and soon all of the building trades working on the project vowed to follow their own code of ethics. The Powering America Team is proud to be an example of excellence on any project and The District Detroit was no different. This project is Detroit’s own commitment to excellence by bringing jobs, economic prosperity, and a sense of pride back to the heart of Detroit. 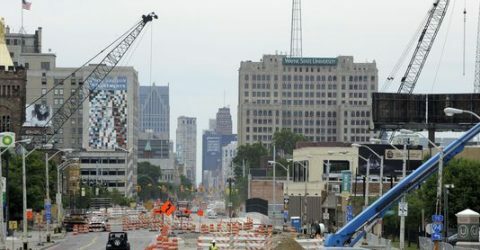 The District Detroit is expected to generate $1.8 billion in economic impact, therefore Motor City Electric Co., IBEW Local 58, and Southeastern NECA implemented the Code of Excellence from day one, encouraging the other trades to do so as well. The District represents a return to excellence for the city of Detroit as well.